Medeni Mesec (Honeymoons is the English title) earned a spotlight in the course of this year’s RIFF as it represented the first co-production between Serbia and Albania. Hostilities among populations in the Balkan peninsula have been a serious issue for a long time; Serbia and Albania share an endless history of reciprocal hatred. It’s only right to encourage projects promoting collaboration and understanding, but I’m sorry to say in this case what seemed to be an interesting undertaking turned out to be a dreadful piece of cinema that should be avoided at all costs. 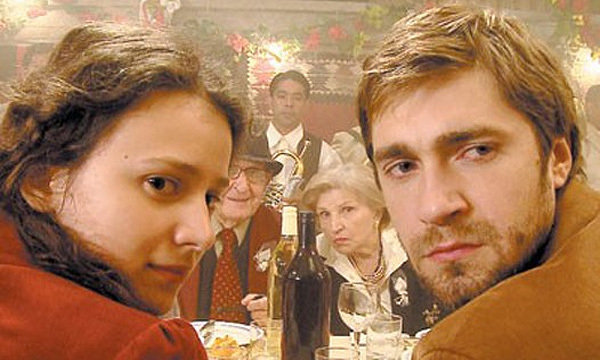 The film involves two couples, one Albanian and one Serbian. Nick and Majlinda are Albanians. Majlinda was engaged to Nick’s brother, Ilir, before he went missing while trying to cross the sea on a raft to reach the Italian coasts three years earlier. Nick loves Majlinda, but he cannot marry her as long as they live in Albania: the girl, disowned by her family, has to wait for Ilir’s return, or at least for his body’s retrieval. Nick plans to escape with Majlinda to Italy so that they are finally free together. Vera and Marko are Serbs. Marko, a cellist is offered an audition at the Wiener Philharmoniker. Vera’s and Marko’s intention to move to Austria in order for Marko to fulfill his dream. Dreams however are not always destined to come true. Nick and Majlinda on one side and Vera and Marko on the other will find out escaping from a troublesome situation is not just a matter or personal willpower. The couples’ stories proceed on parallel tracks, never really getting in contact. They share similarities – both couples attending a wedding, both willing to emigrate to Western Europe, both dealing with familiar difficulties – but apart from that there is nothing uniting them. The common ground on which both stories rest is the menacing reality of the tumults in Kosovo. Serbs and Albanians shaped their mentalities over years and years of acrimony and conflicts. The situation, although the tumults seem to have nothing to do with the life of common people, affects the existence of the main characters directly and violently. Hatred’s long hand, like a shadow, obscures the bright future the two couples were dreaming for themselves. What is really unbearable about Honeymoons is not its premises. The idea could have been excellent material if only… If only it were in the hands of another crew and filmmaker. Honeymoons is a lousy film, with not a single moment in it that’s worth the time it takes just to buy the ticket for it. The cast, for instance, it’s plainly terrible. I don’t think I have watched anything as bad as this film in terms of acting in the last… ten years, maybe more. The performance from all actors feels a lot like the performance in very cheap Latin American telenovelas. Every expression and every gesture are so affected, every line of dialogue is uttered in such a fake tone, that in some moment I truly wanted to stick a fork in my ears and gouge my eyes out. Also, I think even performers at the lowest level know at this point that they shouldn’t be looking at the camera, unless it were functional to the film. I caught more than once the actors glancing at the camera for a mistake. I mean, c’mon! Honeymoons isn’t a brechtian work nor it is an experimental film… why the hell those actors couldn’t restrain themselves from doing that?! Geez, it was truly maddening! Not even unprofessional actors in neorealist films back in the days did that, and they were truly unskilled persons that had never got close to a camera before in their whole lives. I couldn’t sit still on my chair for the pain it caused me to watch those people being totally incompetent. The cast is not the only problem anyway, in case you’re wondering. Every direction solution chosen by Paskaljevic and his crew is the easiest possible: from the way the camera moves and inspects the character’s actions and feelings, to the quality of the script, to the way every story is outlined and developed, to the film’s pace, to the purely cinematic inventions to reveal for example the characters’ motivations, the result being that Honeymoons is on the whole a feast of bad taste and commonplaces. Don’t think I am being mean. Since this co-production was an important step towards brotherhood and understanding between people at war and one shouldn’t criticize the effort and blah, blah, blah. Promotion of brotherhood and understanding through a medium like a film is very welcome; promotion of bad cinema is not. Many films around the world are, each year, produced in very forbidding and sometimes even dangerous conditions. Many of these films are reasonably well-done, some are extremely valuable works. Honeymoons is not. Let’s hope next time friendship between Serbs and Albanians will find a better sponsor.